But don’t worry. I’ll find you. I just need to sift through the story of us to get to where you might be. I’ve got places to look, and a list of names. The police have a list of names, too. See now? There’s another lie. There is only one person they’re really looking at, Molly. And that’s yours truly. Buckle up because this book is going to take you on one wild ride! I read this book on my Kindle while at the gym and I swear it made me amp up my Cardio! I was flying through the pages so fast, devouring every word and eager to know how everything unraveled. The book is told from the position of Now, Then, and Molly; Now and Then is from Cobain's perspective. I love that Victoria Scott crafted it this way. It was delivered flawlessly and really added to the overall suspense and intensity of the story. Scott also created outstanding characters. Cobain is somewhat of an outcast and when he meets his match in Molly, a uniquely beautiful, slightly broken girl, Cobain is almost immediately infatuated by her. It's not long that he is fallen under Molly's spell. Molly comes from a past that resulted in her putting up the highest, most cemented walls around her heart. She doesn't allow many, if any at all, to see her true self. These traits of Molly's play a big role in the story. We Told Six Lies will have you questioning everything. You'll think that you have it all figured out only to have your theories ripped to shreds. 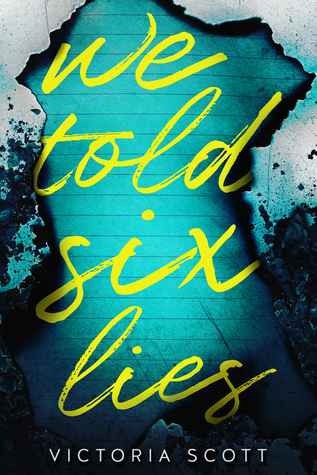 We Told Six Lies has many side stories and flashbacks but they are all vital to the overall story. The Author gives you a lot of great background story yet it doesn't feel bogged down or too detailed. It was a necessity for the novel and it was all unpacked beautifully. Victoria Scott created a fast-paced, nail-biting reading experience. It's not the most unpredictable storyline yet she penned it in such a way that will leave you breathless and jaw-dropped. I loved every minute of it! Dear Evan Hansen,Today's going to be an amazing day and here's why...When a letter that was never meant to be seen by anyone draws high school senior Evan Hansen into a family's grief over the loss of their son, he is given the chance of a lifetime: to belong. He just has to stick to a lie he never meant to tell, that the notoriously troubled Connor Murphy was his secret best friend.Suddenly, Evan isn't invisible anymore--even to the girl of his dreams. And Connor Murphy's parents, with their beautiful home on the other side of town, have taken him in like he was their own, desperate to know more about their enigmatic son from his closest friend. As Evan gets pulled deeper into their swirl of anger, regret, and confusion, he knows that what he's doing can't be right, but if he's helping people, how wrong can it be?No longer tangled in his once-incapacitating anxiety, this new Evan has a purpose. And a website. He's confident. He's a viral phenomenon. Every day is amazing. Until everything is in danger of unraveling and he comes face to face with his greatest obstacle: himself.A simple lie leads to complicated truths in this big-hearted coming-of-age story of grief, authenticity and the struggle to belong in an age of instant connectivity and profound isolation. What rock am I living under where I have never seen nor heard of this musical?! I am embarrassed and ashamed! 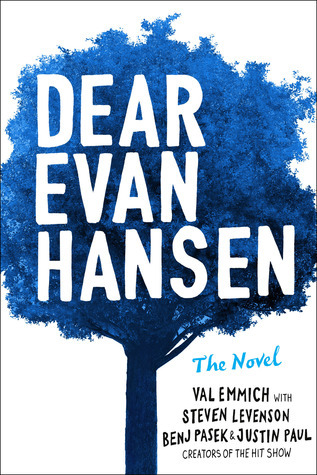 Thankfully, I was able to get my hands on this book and was introduced to the outstanding story that is Dear Evan Hansen. This story was beautifully written and packs quite the punch. It tackles the trials and tribulations of surviving high school, depression, suicide, and the effect all of these things have on the people and families around them. Despite the heavy subject matter, there is a humourous undertone to the novel. Evan, although mostly at the expense of himself, has a great wit to him. And Jared, Jared is spectacular and he and Evan's back and forth banter definitely provides some comedic relief. The novel delivered a great background into Evan's life without weighing down the reading experience. Little bits of Evan's life are sprinkled throughout the entire novel that you feel you are really getting to know this beautiful character. Although the book is geared towards Young adults, I find any reader would be a suitable audience for this book. It's a deep and raw story with a powerful voice. And there will be at least one character someone can relate to, whether that be Evan, Conner, Zoe or even Evan or Connor's parents. I feel each character can offer a common ground with each reader. I truly loved every minute of Dear Evan Hansen. As we are wrapping up 2018 I am looking back at all of the amazing books I've read, yet this one definitely moves its way to the top 5. It's tragically beautiful, almost a dark comedy. I hope to finally see the musical one day!